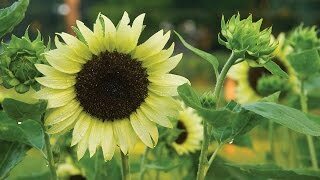 An amazing giant heirloom sunflower with enormous blooms, up to 1 ft. across. The large yellow flowers with brown centers top plants 9-12 ft. tall and yield heavy loads of seeds. Fast and easy to grow, Mammoth sunflowers are great for creating a sunforest for kids, a tall annual hedge or screen. Sow in the spring after the last average frost date. When around 3" tall, seedlings should be thinned to 2 ft. apart. Edible seeds attract birds and make great snacks. To save seeds, cut the stem beneath flower heads when the backs of the flower heads turn yellow. Hang upside down and let dry in a cool, dry place for about a month. Cover with netting or a paper sack with holes to keep seeds from falling. But watch out for squirrels! Certified Organic Seed. Sunflower, Mammoth Organic is rated 3.9 out of 5 by 8. Rated 2 out of 5 by Eamaya from Sprouted but a strong wind knocked them down Staked these in multiple sun patches but wind knocked them over. They seemed pretty spindly at about 12" tall. Rated 1 out of 5 by gpwdr from nice big flowers Nice big flowers, but only two came up out of 50 seeds? Rated 4 out of 5 by Taichiplayer from Beautiful Flowers These sunflowers didn't get as big as I expected. Maybe I planted them too late? They are open now and are beautiful. Rated 5 out of 5 by rjj3 from TRULY MAMMOTH HUGE SUNFLOWERS, planted the first seeds around Memorial day and the all sprouted only to have the tender shoots eaten by chipmunks. Started the next batch of seeds in little pots and transplanted once they were 6 inches tall. all seeds germinated and plants are over my roof !! Rated 5 out of 5 by sunflowerlover from I planted 6 of these sunflowers, but slugs ate th4em before i had a chance to sluggo down. i will plant these again next year! Rated 5 out of 5 by AZgardner from Highly Recommend Purchased the Mammoth Sunflower seeds back in April and so far I am very pleased with them. Every seed planted came up and several are near ready to bloom! They look healthy and are definitely worth getting because they add great color and height to any garden!! Rated 5 out of 5 by mtgal from first time grower.......... Awesome huge strong plants...a winner!